Kudos to Chief Minister Arvind Kejriwal and all others in the Delhi government responsible for announcing a car-restriction program. It is great to see city leaders realize that private vehicles cannot solve its mobility problem and start a diet programme. Even London needed 30 years of debate before a visionary mayor, Ken Livingstone, put in place a congestion tax. In the last 20-30 years, Delhi has been building wider and faster roads as well as more flyovers to solve urban transport. Clearly, it hasn’t worked. Delhi has 10,000 km of roads, one of the highest road densities in the world. But this has only increased congestion and amplified associated externalities like air pollution and traffic fatalities. People have got used to their private vehicles. Nobody understands the full cost of using a car. Nobody realizes that 10 percent of car users monopolize the bulk of the public asset that is roads. Parking is another huge subsidy a car owner receives. In addition, private vehicle users create huge social and environmental costs due to congestion, air pollution and road traffic deaths. Several cities around the world, including Mexico City, Bogota, Sao Paulo and Santiago, have implemented licence-plate restrictions in various forms. Mexico City’s story resembles Delhi, where car restriction was started to counter the extremely high pollution levels in winter. The idea originated when air pollution levels were seen to drop significantly on car-free days, similar to Delhi’s Raahgiri initiative, where small sections of roads are car-free on Sundays. Vehicle restrictions in Mexico City began in 1987 as a voluntary initiative led by an environmental group. By 1989, the metropolitan area of Mexico City was faced with such high levels of atmospheric ozone that the government implemented a program that banned the circulation of 20 percent of all private vehicles on each weekday between 5 am and 10 pm. The ban was based on the last digit of the vehicle’s licence plate. Early results were good, with reduced fuel consumption, faster road speeds, etc. However, these gains were shortlived, as by 1995, about 22 percent people had bought second cars. These second cars became notorious as “chocolate cars” for the color of their exhaust, as they were cheaper, older, poorly maintained vehicles, bought with the purpose of circumventing the car restriction by those who could afford it. Vehicle restrictions were first introduced in Bogota in 1998. Here, 40 percent of private vehicles were prevented from operating in the city each day between 7 and 9 am and between 5.30 and 7.30 pm. Vehicles having any of four digits as the last digit of their number plate are restricted each day. Over the years, the program has helped significantly reduce peak-hour congestion in Bogota. While congestion has reportedly worsened in the hours before and after the restriction period, peak-hour travel times have reduced by 40-50 percent and car users have managed to change their schedules, organize car pools or use taxis. The reason Bogota succeeded where Mexico City struggled was that the initiative in Bogota was accompanied with implementation of the bus rapid transit (BRT) and cycling infrastructure. This ensured that public transport was boosted to deal with the added influx of people and did not choke with the additional pressure. The Delhi government should learn from these experiences and design the details carefully. For example, policies and rules to prevent second-car purchases should be envisioned. Research shows that middle-class or lower-middle-class women are most impacted by this policy. The needs of these groups should be understood and alternatives like carpools and taxis should be presented to them. An accompanying campaign targeted to improve women’s security in buses and other public spaces should be started. This is a good short-term measure that helps initiate a much-needed conversation on restricting motor-vehicle use. In the medium term, there are complementary measures to make our urban transport system more accessible and equitable that should be taken. One, roads must be made safer for people to walk and cycle. 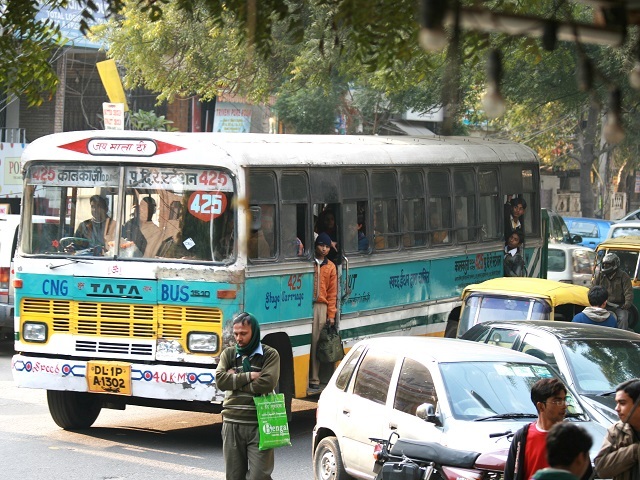 Two, the speed and quality of bus-based mass transport, including BRT, must improve. Three, there needs to be multimodal integration through schedule, fare and physical integration. Finally, progressive regulations for emerging shared mobility trends like ridesharing, carpooling, shared bicycles and taxi aggregators should be followed. This article was originally published by the Indian Express, and appeared on WRI India.